Video: Hillary Clinton mocks Trump (and herself) on Saturday Night Live. 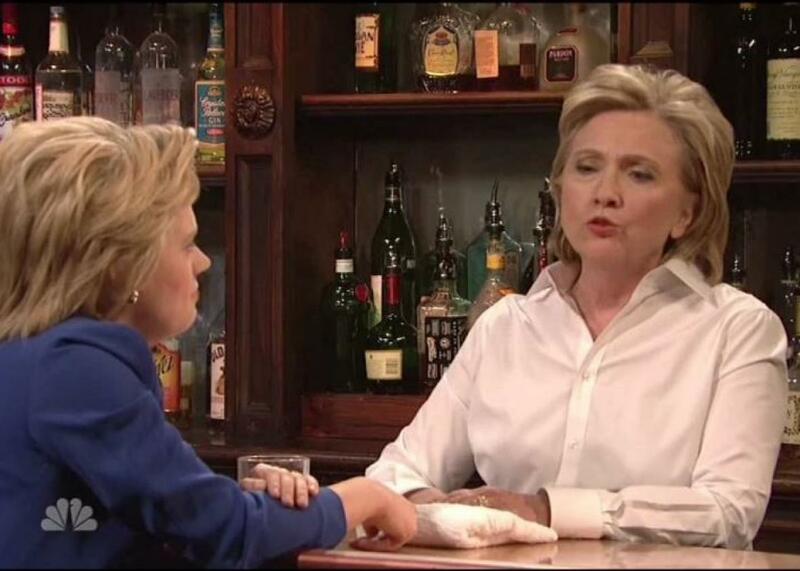 Hillary Clinton plays Val, a Trump-imitating bartender, on SNL. Hillary Clinton made a guest appearance on the season premiere of Saturday Night Live, where she starred in a skit that featured show regular Kate McKinnon playing the Democratic front-runner. Clinton played the role of Val, a bartender serving a downtrodden candidate. “I’m just an ordinary citizen who believes the Keystone pipeline will destroy our environment,” Val says by way of introduction. The skit then goes on to mock how slow Clinton was to express opposition to the Keystone pipeline and how long she took to support marriage equality. “I could have supported it earlier,” McKinnon said. “Fair point,” Clinton conceded. “I wish you could be president,” McKinnon says near the end of the skit. “Me too,” Clinton replies.